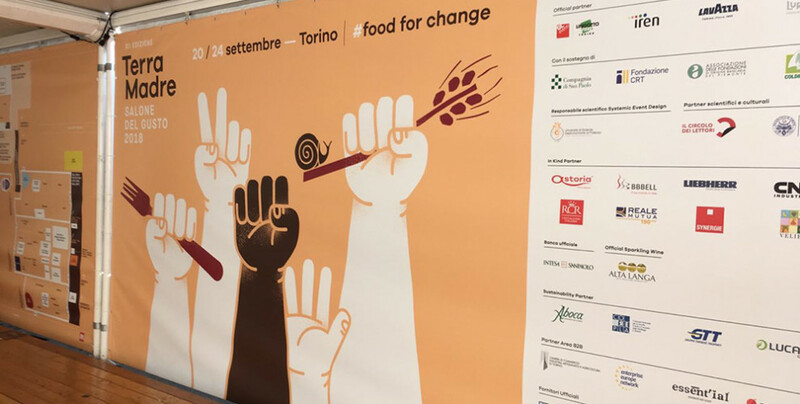 This year Rojava and its unique model of self-run community co-operatives was presented at the event attended by 5,000 delegates from 160 countries, over 800 exhibitors, 300 Slow Food Presidia and 500 food communities from the Terra Madre network to Turin (Piedmont, Italy). The regions of democratic autonomy in Rojava, the economic system is developed in a context of self-subsistence rather than profit. The aim is to involve the entire society in production to meet the needs of the population, and to create a standard of living that increases the well-being of citizens in a dignified manner. For decades the Syrian regime has imposed on the regions of Rojava economic policies related to its interests, preventing any development. The seven years of civil war, the conditions of repression imposed by groups like the DAESH and al-Nusra in addition to the attacks of Turkey have made matters worse. To this must be added the embargo of neighboring countries, which prevent the arrival even of fundamental and necessary products to our economic system. Speaking at Terra Madre, Ozlem Tanrikulu, representative of the Committee for the Reconstruction of Kobane and President of UIKI (Kurdistan Information Office in Italy) explained: “We have not yet succeeded in developing a system like the one we are planning, but we have been able to lay the foundations for understanding the principles and models of production and adapting them to our project”. In the context of existing conditions and needs, the economic area within the democratic autonomy system is organized into five committees: 1-agriculture and livestock; 2-industry; 3-commerce; 4-cooperative; 5-economy of women. These committees, Ms Tanrikulu said, “have been set up in the existing executive structures of each council. We tried to develop co-operatives and economic units in every field at the community level. The economy has some basic principles that are applied to increase the quality of economic production. In the context of equal rights, measures of competitiveness are observed. Taxes are calculated based on prices”. An ecological balance, explained Tanrikulu, “is applied according to the form of production and governance. Economic production in Rojava is based 80-85% on agriculture and livestock breeding. Wheat production is an important part of agricultural production. Irrigation needs of agricultural production are met through underground water wells. There are 53 thousand wells in Rojava, but only 21 thousand can be used, the others can not be used in the current situation. The flow of rivers is gradually decreasing”. Because of the war, the production of bread is the most fundamental need of the population and 55 thousand tons of flour are produced daily and distributed to the population. “Three large mills, 13 large ovens and 251 smaller, private ovens strive to meet the needs of the people. – explained Ms Tanrikulu – The committees set up in the agricultural sector work in collaboration with agricultural research centers on issues such as soil analysis, water quality, water supply and soil health. As for the industry sector, there are factories manufacturing cotton, canned foods, sugar, clothes, olives and cleaning products. Ownership and management of the vast majority of manufacturing industries have been given to public co-operatives formed by the self-government system”. Ms Tanrikulu also said that “there are 81 women’s co-operatives and a special research and study work is done to ensure the participation of women in the production and management of the economy. Western Kurdistan is a fertile agricultural area thanks to adequate climatic conditions. The cantons of Cizîrê, Kobanê and Afrîn have always been a center of attraction for their rich underground and terrestrial resources. These lands, particularly rich in olives, wheat, corn, barley, chickpeas, spices and coal, have served Syria for many years”. The Rojava Revolution started in July 2012 with the people from the bottom taking control of the region and still continues with extraordinary developments in many areas. “Many institutions have been formed to organize people and to protect and develop the benefits of the revolution”, said Ms Tanrikulu. Slowfood has contributed directly to a first project of gardens in local schools in Kobane in order to contribute to the reconstruction of the economy and to restore confidence to the population after the harsh attacks suffered in recent years, recalled Ms Tanrikulu. In Syria pistachios are produced in the regions of Kobane and Manbij. Yet as Ms Tanrikulu recalled, “since the local population has been forced to leave due to the war, and especially because of the threat of ISIS, which has burned a large number of plants, there has been no production in the Kobane region in the last five years. If the pistachio trees are not recovered, they will risk extinction and biodiversity and livelihood of poor households in the regions will be at risk”.